Photo booths are wildly popular. But accord­ing to industry professionals, event plan­ners aren’t always aware of how smart and sophisticated today’s photo booths have become. “The photo booth has come a long way since the ones at the mall,” says Jonathan Coelho, chief marketing officer at Toronto-based Abbey Road Entertainment, adding that many are now open concept—you can’t step inside—and while they may still spit out prints, they’re also super high-tech marketing tools. Be trend savvy: Coelho says, “People are mov­ing away from the physical print more towards the instant social sharing.” He also notes a rising demand for animation (versus still photography) and sending people to unique locales with the help of virtual reality and green screens. Clarify your goals: Before focusing on high-tech features, set goals and expectations for your booth, says Coelho. “Is this something that is just for fun? Or for marketing purposes?” Identify your budget, goals and audience. Be creative with your concepts: Want to send your group up into the Rockies or down a roller coaster? With smart photo booths, the sky’s the limit, creatively. Vendors have designers on-board—talk to your vendor about virtual reality (VR) and augmented reality (AR) technologies; panoramic 360 degree photography; GIF mon­tages and video loops; slow motion videos; and/or green screen technology. Pay for quality: Professional companies, says Eisenberg, bring the right lighting, professionals and props—and possibly print design, digital overlay, hashtag, social media text and more. What can you expect to pay? For a basic green screen or white backdrop high-end photo booth, around $1,200. More custom options could run $2,500 to $4,000 or more. Don’t hide your booth away in a back room. Set it up in the main event area whenever possible. Promote your booth. To promote social sharing, include prominent signage at your event featuring your hashtag. Booths have bigger footprints today, so plan for enough space and electrical outlets. If setting up outdoors, talk to your vendor about generator and tent options. Hire a photo booth attendant to animate and troubleshoot. 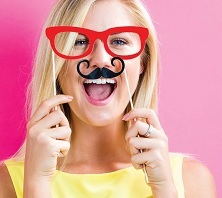 Run the photo booth when at­tendees are mingling—avoid mealtimes. A “green screen” really is green. If this doesn’t go with your event design, use a themed backdrop instead. Because privacy is an evolving issue, discuss privacy protection with clients and vendors upfront.